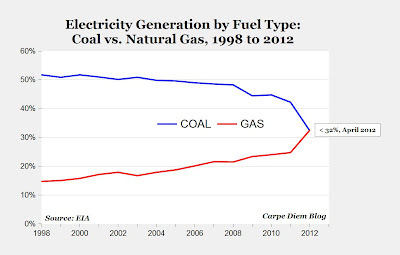 The Energy Information Administration reported this week that for the first time since it began keeping monthly records, "natural gas and coal had the same share of total net generation of electricity at 32% during April 2012 (see chart above)." This is one more reason that America's natural gas windfall represents "one of the most important developments for the economy in the last 60 years," as I reported earlier today. In the process of creating thousands of jobs and saving natural gas customers billions of dollars, the shale revolution has also significantly reduced carbon emissions as electricity producers have switched from dirty coal to clean, cheap natural gas. It's really no exaggeration to say that the United States really managed to "hit the energy jackpot" with shale gas. 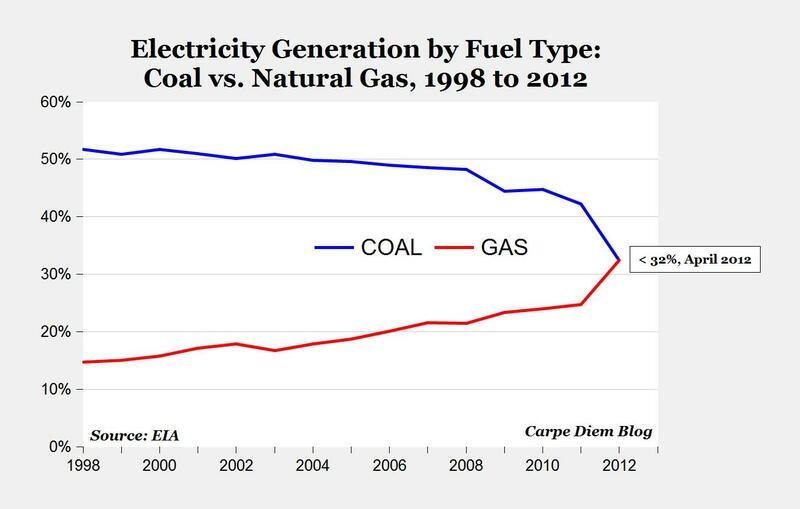 And if Obama gets another term that line representing coal should be approaching zero...don't forget that he vowed to destroy the coal industry. In the long run, commodities and manufactured goods will get cheaper--provided we do not overtax, or over-regulate, and we prevent public/federal parasites---military or civilian---from eating up too much of the pie. Natty fueled electrical generation will be the rule this summer as the storage overhang is worked off. However, do not think $2 natual gas is permanent as production has been falling since November! The idea of the secular shift, though, is spot on! Outside of the U.S., coal is still in demand. I read in the attached link where last year marked a twenty-year high in U.S. coal exports. Time to start looking at investments in coal.